Even for established restaurateurs, opening a pop-up presents distinct challenges. Even for established restaurateurs, opening a pop-up presents distinct challenges. 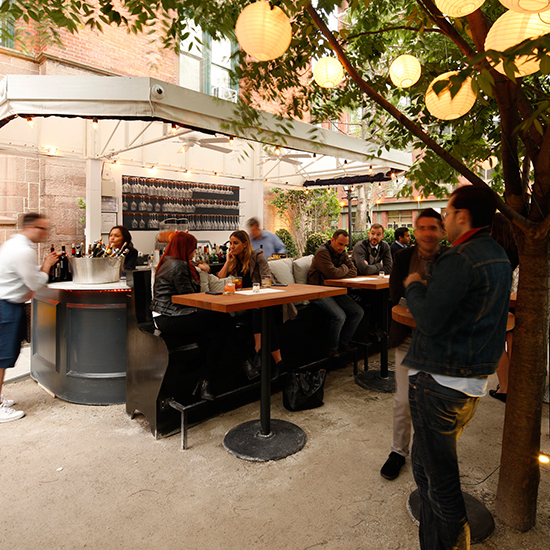 When Epicurean Group’s August Cardona and Joe Campanale opened Alta Linea, their ode to outdoor Italian dining at Manhattan’s High Line Hotel, they quickly discovered they’d have to attract an audience and get the whole thing running smoothly with no practice period. Here, the duo shares the lessons they’ve learned from opening their first pop-up. 1. Search out a spot with potential. “Finding space in New York isn’t too difficult for a pop-up,” says Cardona. “There are plenty of landlords that ‘get it’ and see the value.” What’s tricky is finding a venue that attracts sufficient foot traffic and has the potential to transform into a special place. When Cardona and Campanale found the open courtyard that would become Alta Linea, they knew this was the right place to create a pop-up dedicated to alfresco dining. 3. Develop a signature offering. At Alta Linea, the frozen negroni developed a serious following. Campanale credits the fact that it was perfectly suited to both the concept and the season.